Operant Subjectivity: Rationality vs. Rationale Among Trump Voters in 2016: What Were They Thinking? Rationality vs. Rationale Among Trump Voters in 2016: What Were They Thinking? Rational-choice models, imported from economics, represent the most persistent theoretical influence affecting research on voting behavior in an American context. A theory posited by Anthony Downs (1957) made the claim that voters act in their own economic self-interest. Indeed, the specter of an electorate inclined to vote in a manner sabotaging its economic self-interest has recently received renewed interest as a result of Donald Trump’s unexpected victory over Hillary Clinton in 2016. Though Clinton compiled nearly three million more popular votes nationwide than Trump, the latter won the electoral-college vote thanks to the defection of white working-class voters, a demographic normally considered a reliable affiliate of the Democratic party, in the key states from Pennsylvania westward through Michigan and Wisconsin; in fact, estimates claim as many as eight million members of this bloc switched to Trump after having voted in 2012 for Barack Obama. 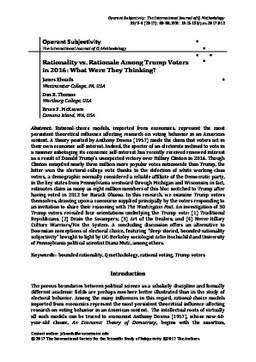 In this research, we examine Trump voters themselves, drawing upon a concourse supplied principally by the voters responding to an invitation to share their reasoning with The Washington Post. An investigation of 30 Trump voters revealed four orientations underlying the Trump vote: (1) Traditional Republicans; (2) Drain the Swampers; (3) Art of the Dealers; and (4) Never-Hillary Culture Warriors/Fix the System. A concluding discussion offers an alternative to Downsian conceptions of electoral choice, featuring “deep-storied, bounded-rationality subjectivity” brought to light by UC-Berkeley sociologist Arlie Hochschild and University of Pennsylvania political scientist Diana Mutz, among others.